signed and dated 1960 and on verso titled and inscribed "PS"
From early childhood Ray Mead exhibited a natural talent for visual art and, encouraged by his family, he attended the Slade School of Fine Art in London, graduating at the age of 18. Shortly thereafter he joined the Royal Air Force, and an injury from a crash landing during his service in World War II led to his assignment as a flying instructor, headquartered in Hamilton, Ontario, for the war's duration. His misfortune became Canada's good fortune when, after the war ended, he chose to settle in Ontario permanently. With the mentorship of his friend and fellow Hamiltonian Hortense Gordon, Mead began to participate in the Art Gallery of Hamilton’s annual exhibitions after 1947, and he joined the group of artists who became known as Painters Eleven. It is not often that a Mead painting from the period in which Melville Island was created comes to light. 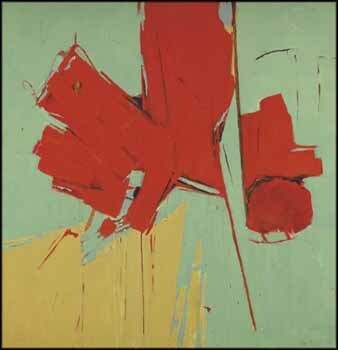 Consistent with his earliest abstract works, Mead's starting point is the landscape, and his palette and bold brush-strokes are suggestive of organic growth, accented, if we dare to imagine it, by a glowing red maple leaf.